Christian Frosch, James Howell, Barbara Camilla Tucholski, Frank Gerritz, Bettina Blohm, Heinrich Küpper, Rozbeh Asmani, Danica Phelps, Gerda Steiner u.a. The Exhibition COLOR AND SYSTEMS shows works from artists of the gallery as well as invited artists from Germany, Switzerland and the USA that all have very different systems which they apply when dealing with color. ROZBEH ASMANI (*1983 Shiraz, Iran) is Meisterschueler of HGB Leipzig and is currently graduating from a postgraduate program at KHM Cologne. His working group COLOURMARKS visualizes the connection between abstract colors and the Identities of Corporations through colormarks. BETTINA BLOHM (*1961 Hamburg) is drawing while traveling and in her studio in Berlin while in New York she is focusing completely on painting. The two works THE DAYS exemplary show her way with abstraction and color in space. CHRISTIAN FROSCH (*1968 Gräfelfing, lives and works in Munich) has dedicated the last 15 years to research on painting. His work GUERNSEY COLOUR TEST was inspired by the everyday use of color as a material in hardware stores. His single exhibition with results of his research on painting can still be seen at the gallery until 8th of November. FRANK GERRITZ (*1964 Bad Oldesloe, lives and works in Hamburg) known for his formal and conceptual pieces with graphite on paper and MDF, for the working group DARK LIGHT SPACE in the beginning he used remains that accumulated from his works on aluminum. JAMES HOWELL (1935 – 2014 USA) will not be able to witness this exhibition. He died last month after an artistic life under the sign of LIGHT and TIME. His modulations of gray shades remain. HEINRICH KUEPPER (1919 – 2009 D) has devoted his work to the line. In the last decade of his life it was colors that fascinated him. Aside from single sheets he created artist books which in a very special way illustrate his serial method. Many of these books are part of a museum collection like the Kolumba Museum in Cologne. We show these works for the first time in the context of a gallery. DRAWING STORIES at Museum Folkwang in Essen. GERDA STEINER & JOERG LENZLINGER (1967 Ettiswill, 1964 Uster, live near Basel and work worldwide) are known for their installations ever since their participation in the 50th Biennale of Vennice in 2003. In the lobby of Museum Kunstpalast in Düsseldorf their work DAS VEGETATIVE NERVENSYSTEM is shown as a permanent installation. 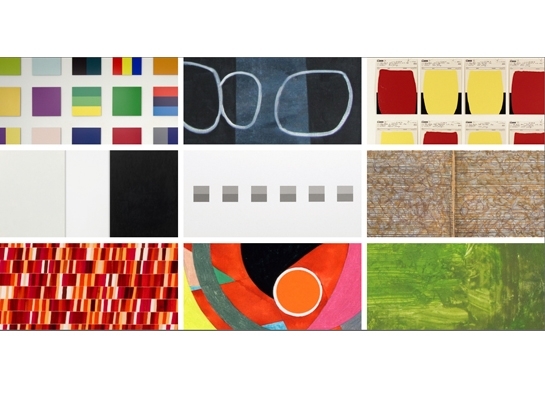 For the exhibition in Cologne they have both together and on their own created colorful and collaged works on paper. BARBARA CAMILLA TUCHOLSKI (*1947 Loitz, lives and works in Oevelgönne, Vienna and Rome) is known for her spatial drawings and place specific spatial installations. For many years she captures the color ambiance of the places that she works at. A selection of these color sheets will be shown in Cologne for the first time.